Enjoy all the activities found on other Hawaiian islands without the traffic and crowds. Fabulous snorkeling from shore, or adventure trips to Lanai; Scuba diving in Hawaii's only barrier reef; fishing and sport fishing; surfing and boogie boarding; kayaking; sailing; biking and mountain biking; hiking the spectacular Kalaupapa sea cliff trail, Molokai's rain forest and Kamakou Preserve; horseback riding; whale watching, and much more...or, relax under a palm tree on a secluded, quiet and uncrowded beachfront with vistas of Maui and the mountains of Molokai, lay by the pool, and not be bothered by crowds, traffic, noise; visit the local library and learn about the Hawaiian history, customs, even how to play a ukulele! And never encounter a stoplight on any of your adventures! 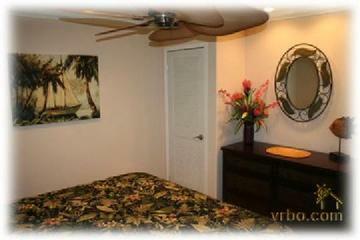 Wavecrest Resort is located on the east side of Molokai 13 miles from Kaunakakai. East Molokai is semi tropical with a mix of lush vegitation, trees and grasslands. It's shores are portected by Hawaii's largest barrier reef and as such provides calm protected shorelines and is also the home of the King's fishponds constructed by the early Hawaiians. C309 is a third floor C Building unit with ocean vistas of the islands of Maui & Kooalawe over the oceanfront tropical garden grounds of Wavecrest. It is located mid building. 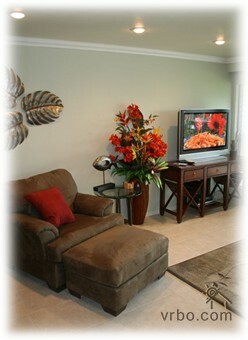 Our condominium has been completely renovated and refurnished, including appliances. Special features King Bed, 42" flat panel HDTV, HD cable, DVD player and Wi-Fi high speed internet. The beachfront pool and cabana at Wavecrest offers many ammenities. Cabana lounge chairs, tables, chairs and ceiling fans with ample lighting for evening, guest donated library, gas BBQ's, referigerator (no ice chest and no trips back to the room), food preparation area with sink, paper towels and soap, and restrooms. 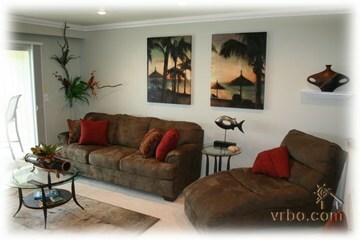 You can also choose to lounge at the waters edge on the lawn under gently swaying palms. Molokai is Hawaii without the glitz and glamor of shops, stores and dining, and provides a peaceful truly hawaiian experience that is no longer found on the other islands. Please feel free to contact us for information on Molokai, transportation from the mainland or other islands, etc. We are sure you will find Molokai a wonderful vacation spot, as we did after just our first visit. For your convenience, we allow anytime check-in on arrival date and anytime check-out on departure date. 50% required with reservation, remainder due 60 night prior to stay. Full refund less processing fees if canceled 60 nights prior to stay. Non-refundable within 60 nights of arrival unless we are able to rebook. Cleaning fee of $75 $250 Refundable Reservation/Security Deposit Non-smoking/No petsNote: Until confirmed, rates are subject to change without notice. Pool & Cabana Area with Restrooms, Kitchen & gas BBQs.